The 19th edition of BarCamp Prishtina officially opened the new year of BarCamps in Kosovo. More than 80 participants gathered in Oda Theatre this time to discuss for Education and Internet. Rineta Hoxha, Agron S. Didida and Visar Jasiqi had interesting presentations which encouraged a fruitful discussion with the audience. 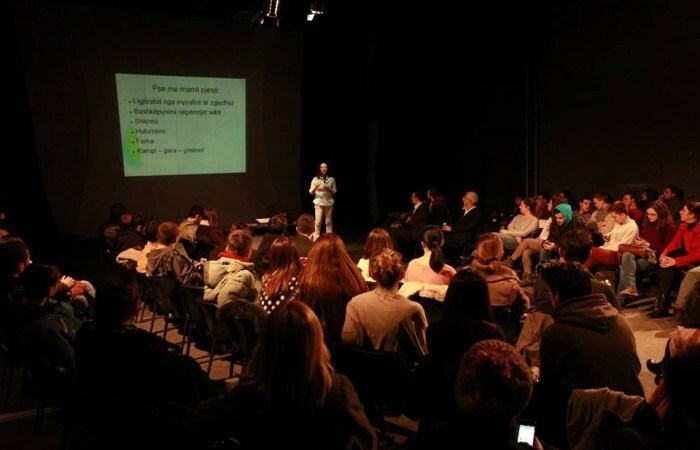 As the team behind the biggest project of Kosovo’s Digital Diplomacy continues its work in nine different cities of Kosovo, it was time for Wiki Academy to be presented in BarCamp. Rineta Hoxha from IPKO Foundation unfolded details from this project which in the second edition is becoming much bigger. “Wiki Academy Kosovo is coming differently this time. Academia will gather participants from nine different municipalities of Kosovo who will compete with each other on the best content posted on Wikipedia for their cities”, she explained. Rineta’s presentation ended with a broad discussion about the project and people who were interested to participate. It has never been easier to learn than it is today. This is the conclusion that Agron Dida made after showing an inspirational video of a young girl who succeeded to enter Britain’s Got Talent after working hard to learn how to sing classical music through You Tube. “There are numerous opportunities to learn from internet. I will bring here one of the many websites which you can use to learn many things. Coursera offers hundreds courses from many different fields and almost everyone can find something in there”, he said, while he continued speaking in details for this platform. Dida ended his presentation with a conclusion that Education in Kosovo must change and it should be oriented more toward internet. Success stories of the trainings at TDI were the starting point of Visar’s presentation on the 19th edition of BarCamp. He went back in history to the beginnings of IPKO Institute and the need to train people how to configure routers and ended to the introduction of ECDL and Trajnimi.com. After speaking for past, he moved on to the work he is doing today at AUK TDI. “Due to the market request Kosovo needs professionals and not hobbyists”, he said while giving his message to the audience.